As promised, here’s a bit more detail on the wonderful trash art I encountered in Norway a week and a half ago. 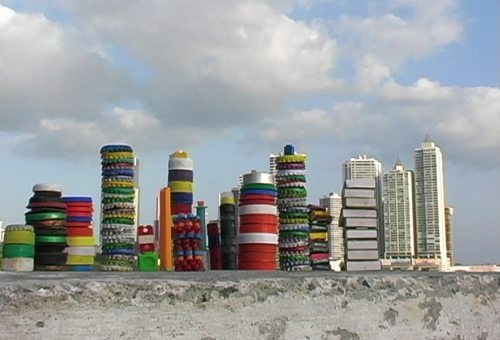 Donna Conlon, an American artist living in Panama, has been a trash artist for years. I saw her videos for the first time at the Recycling the Looking Glass-Trash Art-Found Object seminar before the show opened. Conlon gave an artist’s talk and showed some of her amazing video projects. She was also kind enough to answer some questions for Trashtastic Tuesday. Check out her answers and Web site, where much of her work with trash can be perused. everydaytrash: What are trash trees? 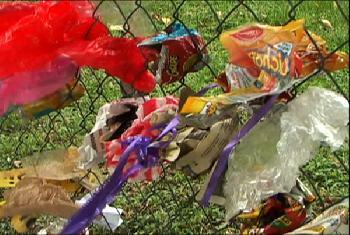 Conlon: they are urban trees which have become “useful” as places to dispose of waste. i discovered them walking around in my neighborhood in Panama City then spent some months photographing them to document the phenomenon. 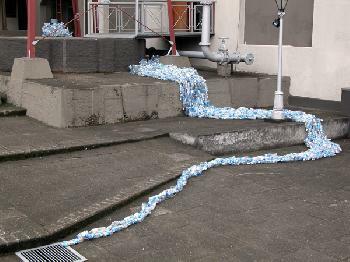 i was just totally intrigued with the fastidiousness they represent – the impulse to put trash SOMEWHERE, and this becomes a very creative solution as the trash is usually placed very deliberately and often with a keen eye for form. i also think they speak to the conflicted nature of our relationship with other living things – we appreciate them with respect to their usefulness to us (more so than for their absolute value). everydaytrash: At the seminar, you were asked about the link between politics and activism. Do you see your work as political? Did it become more political over time? about things/situations in the world i find intriquing or puzzling – the political content reflects my personal preocupations. everydaytrash: What drew you to video? Conlon: the realization that it was more interesting (to me) to not “transform” found objects into something else, but rather to analyze their inherent properties and let them tell us something about ourselves. then video became a way to stay in the discovery moment, to show the actual habitat of the found object (trash being the ultimate found object). everydaytrash: Who are your trash art inspirations? Conlon: i came to using trash in art via the trash, not other artists. i’m an opportunist who uses things that are available in my everyday life, and there just happens to be a lot of trash out there available. that said, if i think about other people who have one way or another used trash in their work, i hold Merle Ukeles in utmost esteem. This entry was posted on Tuesday, April 15, 2008 at 12:59 pm and is filed under Artistic Trash, Trashtastic Tuesdays. You can follow any responses to this entry through the RSS 2.0 feed. You can leave a response, or trackback from your own site. found It positively useful annd it has helped me out loads.